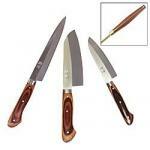 Knives as beautiful as the food they make, sushi and sashimi knives are not found in every American kitchen as yet. If you like knives you’ll want to find a reason to own one. 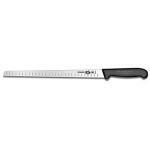 Many would make excellent carving or boning knives as well as being perfect for portioning raw seafood and slicing delicate strips of vegetables. Even if you don’t eat raw fish these are wonderful knives, built for a level of craftsmanship in food preparation that’s unusual in American cuisine. Sushi knives prepare food with attention to form and texture and color as well as flavor. Many of the details would be lost if the food were cooked. The purpose of the sushi knife is fine control and accurate slicing — edges are so narrow and sharp that the food parts in translucent slices without distortion. Low quality knives give low quality results, so buying the best makes sense. That’s hard to remember when even the cheap import sushi knives look like they ought to be really good. I’ve been a tourist in Asia often enough to have acquired caution where bargains are concerned. These knives come from a culture where food preparation is also a spectator sport. You don’t go to the best sushi restaurants just to eat; you go to see the chefs at work. Most of us won’t ever approach that level of skill, but we can aspire to it. Having the knives that make such things possible is certainly a justifiable pleasure. It’s an entry-level sushi blade in a more ordinary stainless steel than the master-level blades, but the Bunmei Yanagi has the traditional single bevel blade design and performs well. Sharpens with ordinary stones and steels. The Yoshikin Global Yanagi is at least close to the high end of the scale and comes in either left-hand or right-hand versions, with the single bevel ground on either side of the blade. Here’s where sushi knife technology meets a new American need: the Wusthof Grand Prix II Salmon Slicer incorporates Japanese design features, creating a blade to slice our favorite American fish into exotically thin fillets. 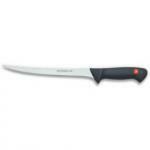 From Forschner Victorinox, this 12-inch granton blade is designed specifically for accurate slicing of smoked salmon. You'll get the famous practical quality of Victorinox cutlery with this important knife, with performance equal to that of much more expensive salmon slicing blades. 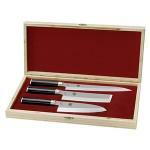 Trademark Global's 3-Piece Sushi Knife set has everything the high-end Asian knives offer except the best steel. If you're an expert at sharpening knives, you may find this budget-priced assortment good enough. Much lighter than the typical forged Wusthof knife, this Wusthof Gourmet 9-Inch Fish Fillet Knife features a slender blade of razor edged and flexible laser-cut stainless steel. The high carbon blade of Wusthof's special no-stain X50CrMoV15 alloy steel holds an edge well and is easily re-sharpened with a handheld honing steel. 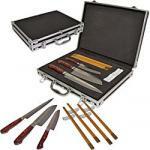 The briefcase-sized metal bound carrying case of this set holds three styles of sushi knives plus four reusable lacquered chopsticks and four ceramic chopstick holders. All pieces fit into cutouts in the foam liner, locked away securely until it's time to cut some fish. Always interesting and always a gamble, I see many knives of this type on the shelves of locally-owned Asian supermarkets when we're out shopping for unusual food. It's hard to know if you've found a bargain in a knife like this until you bring it home. 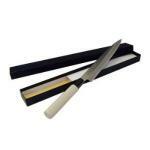 The yanagi or yanagiba is loosely translated from Japanese as willow blade as it resembles the willow leaf. Like many traditional Japanese knives, this knife is a specialty knife intended for one purpose: Slicing raw fish and seafood. This sushi knife features all of Global's signature bells-and-whistles: the sure-grip comfortable handle, single-beveled razor-sharp blade and their patented sand-filled handles for creating a good balance.